Cherry tomatoes are cooked till they burst and then stirred with pasta and kale. It is a very simple recipe with few ingredients and can be whipped up in less than 30 minutes, perfect for a busy weeknight. Heat 2tbsp olive oil in a large saute pan pver medium heat. Add garlic and tomatoes and cook, stirring, until tomatoes begin to burst, about 8~10 minutes. Season with salt and pepper. Cook pasta according to package instructions until al dente. Add kale during the last minute of cooking. Reserve some pasta water and drain the pasta and kale. 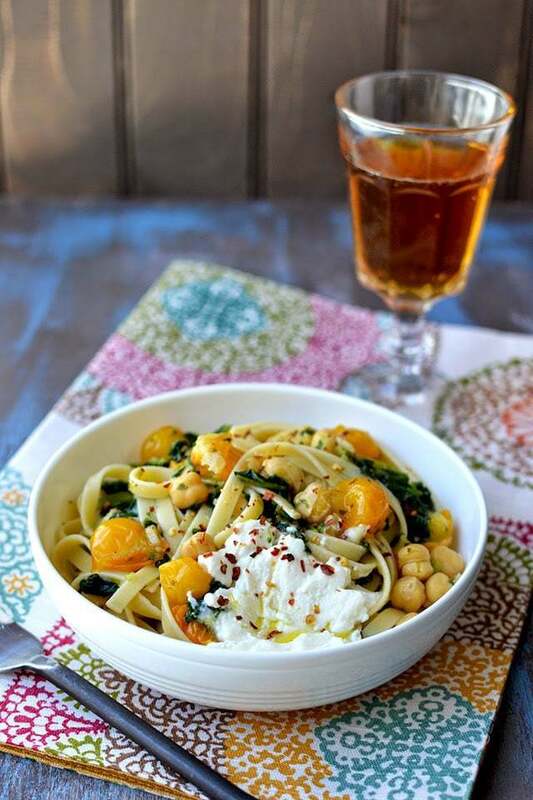 Return pasta and kale to the pot and stir in the sauteed tomatoes and the cooked chickpeas. Add reserved pasta cooking water to adjust the consistency. Divide the pasta into 4 bowls and top each with a dollop of ricotta. Drizzle ricotta with olive oil and season with salt and red pepper flakes. Serve warm! !